For the North American market, Infiniti has had little need for forced induction throughout its 27-year history. After all, there were plenty of V-8, V-6 and I-4 normally-aspirated engines to choose from, and with the advent of the powerful VQ series coming on-line back in 2002… really no need. Variants of the VQ have provided a world class powerplant for Infiniti’s cars and crossovers for the better part of a decade and a half. But that changes for 2016. With ever-increasing emissions and economy standards now and into the future, turbocharging is a strategy Infiniti will use to bolster the power and refinement expected in the luxury market segment. For the Q50 sedan, there’s exciting news in the form of the new 3.0-liter VR engine series in both 300 and 400-horsepower ‘Red Sport’ performance models. Unfortunately, these Tochigi, Japan-produced models are in limited supply and neither would be available by mid-summer. But that didn’t preclude a test of the 2.0-liter turbo Q50 sedan that’s currently on sale in both RWD and AWD versions. Our Hagane Blue Q50 Premium model was a rear wheel drive version, and the first feature that stood out was yet another step in evolving the security system. Step up the curvaceous Q50 and the car recognizes the unique wireless signal sent out by the intelligent key fob. Rather than pressing any buttons, just pull the door handle once and the door is unlocked and interior lights activated. The ’16 Q50’s cabin remains as luxurious as the 2015 Q50 I reviewed last year, with only small changes to the navigation and entertainment systems. This was a good thing, as we toured both Colorado and Utah with plenty of seat time to explore its capabilities. First up was the engine and seven-speed automatic transmission. It’s a positive to report this small, direct-injected four cylinder engine has some kick! While conservatively rated at 208-hp and 258 ft-lbs torque, the Q50 spools up quickly, with only the hint of turbo lag from a standing start. The drivetrain was particularly impressive on mountain highways, where it felt both confident and composed at speed. The engine seems well-matched to the transmission, with almost imperceptible shifts up and down, and little in the way of “hunting” for a gear. It’s a far cry from a vehicle like the past Infiniti G25 sedan, which utilized a normally aspirated 2.5-liter V6 and always felt a bit underpowered throughout the powerband. Economy is also improved over the V6s- with EPA figures of 23 city/31 highway/26 MPG combined on premium unleaded. This is aided by a ‘start-stop’ system which automatically switches the engine off when the car comes to a full stop. 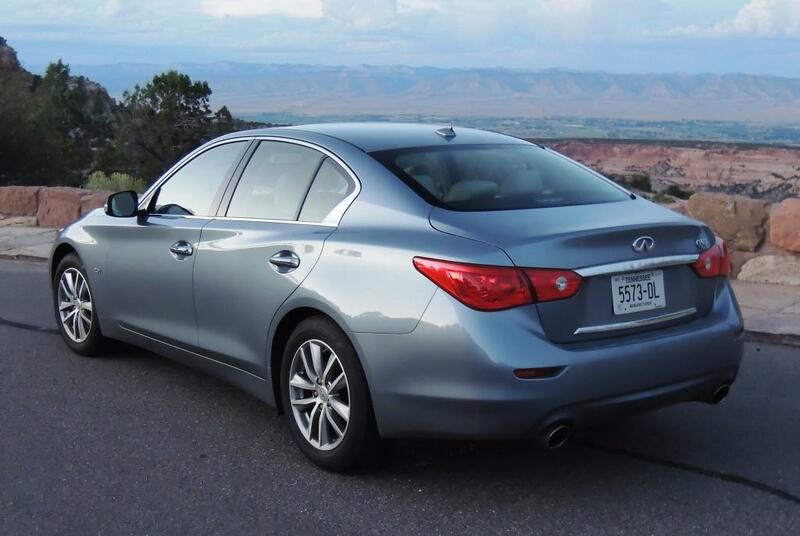 Release just a bit of brake line pressure and the Q50 starts up immediately and is ready for acceleration. One negative to mention is the vehicle monitoring system. While this all-aluminum 2.0-liter engine is sourced from Infiniti’s Dechard, Tennessee foundry, its design comes from Alliance partner Mercedes Benz. Just checking the dipstick shows one key difference – two composite yellow ‘humps’ mark the minimum and maximum oil levels on the bottom of the metal dipstick. After checking fluid levels one morning, an alert popped up on the center gauge panel after a few hours of driving. “Low oil warning” it intoned, and left me scrambling to get off the highway. Dutifully pulling off and shutting down, I rechecked the dipstick. After wiping and reinserting to check the current level, it still read ‘full”. What the hell? Restarting the Q60 resulted in the alert disappearing and the mystery deepening. Turns out this false warning had occurred before in this particular vehicle, but that’s not much of an excuse for such a critical system. Steering and handling were more than adequate, as a speed-sensitive hydraulic steering rack provides good feedback from the 3,798 pound sedan. At slower speeds in the city, the steering is agreeably light, but I continue to prefer a little less boost at higher speeds. The 55 front/45 rear static weight distribution ensures the Q50 will understeer with a vengeance as it nears its cornering limits. But one welcome addition to the Q50’s four-wheel independent suspension system is the use of both front and rear swaybars. 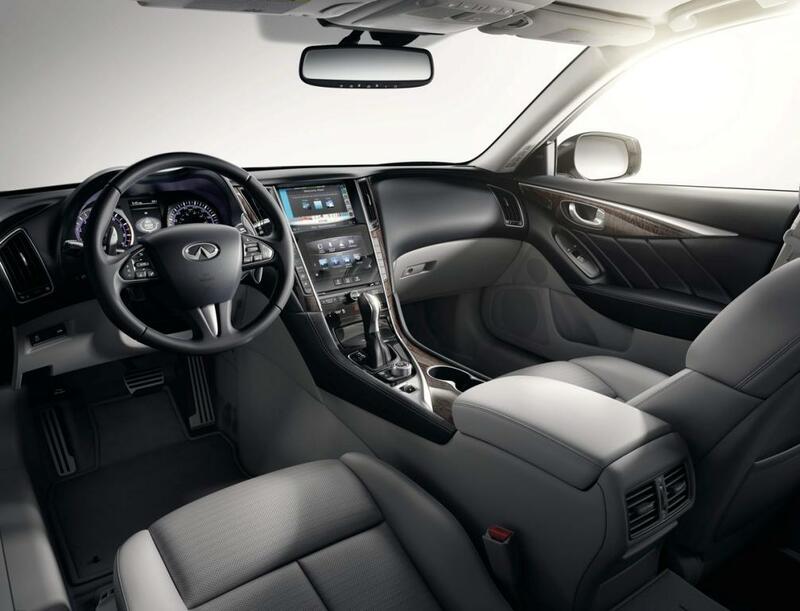 It doesn’t disturb the comfortable ride Infiniti seeks, but reins in the amount of body lean and makes the Q50 better balanced. The ABS brakes (12.6 X 1.1 F/12.1 X 0.6” R) feel strong, but again are too overboosted for my taste. 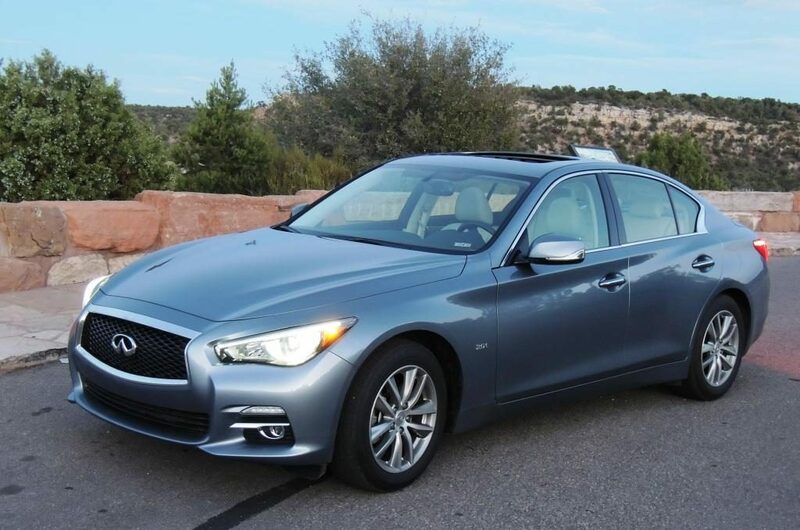 As a package, the Q50’s $40,705 MSRP (including shipping/handling and a $2,150 Premium Plus option) is certainly competitive in the compact luxury sedan segment. With sculpted looks (both inside and out), the Q50 2.0t Premium assuredly offers some distinctive design cues (double arch grille and trunk, crescent-shaped c-pillar molding) that match other sedans in this segment. Infiniti knows it needs this and more, as it continues to go head-to-head against the best that Audi, BMW, Caddy, Lexus and Mercedes can turn out. In this vein, look for Infiniti to introduce a variable compression turbo engine (VC-T) in the near future to gain a significant advantage in this fiercely contested marketplace.